Aquabox is extremely grateful to all the Clubs and Organisations of all kinds across the country who organise and run fundraising events in aid of Aquabox. Rotary Clubs across the UK continue to be great supporters of Aquabox and here are a couple of recent fundraising events that clubs have staged for Aquabox. On the May Bank holiday in 2017, the Rotary Club of Billericay hosted its second Soap Box Derby. For those with long memories this event is akin to the Wacky Races, (remember The Ant Hill Mob, Penelope Pitstop, Peter Perfect, Professor Pat Pending and the rest?) and takes place along the leafy roads of Billericay. The competing jalopies were built by a range of clubs, schools and pubs drawn from across the country with one team coming from as far afield as Lancashire. The gently sloping course is littered with obstacles such as ramps and chicanes which the contestants have to negotiate as they seek to post a winning time. 8,000 spectators enjoyed the event, which raised £40,000 for local and national charities. After dropping by the Aquabox stand at the RIBI conference in Manchester, the Rotary Club of Billericay kindly agreed to to donate £6,000 to Aquabox - a big thank you to Billericay and its partner clubs for this wonderful donation. On a musical theme, the Rotary Club of Solihull St Alphege staged a wonderful evening of jazz in aid of Aquabox. 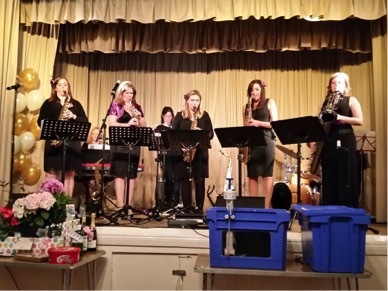 The show was held at the Rowington village hall and featured the all-female sax group "Lady be Good". The club, along with many of their friends danced and swayed along with the music and enjoyed a great evening. A big thanks to the Solihull St Alphege club for staging such a great event and for raising £1,500 for Aquabox. Closer to home, the founder club of Aquabox, Wirksworth Rotary Club, has held a Burns supper and ceilidh on behalf of Aquabox for the past 3 years. This year the address to the haggis was delivered by the headteacher of the Anthony Gell School, Malcolm Kelly, with a translation kindly provided by his wife. The Mayor of Wirksworth, Andy Pollock provided the Toast to the Lassies and our own Aquabox volunteer Nicole provided a robust response. After being well fed we all enjoyed energetic country dancing accompanied by the excellent local band "Speed the Plough". To date these great celebrations to the Scottish Bard have raised over £1,600 for Aquabox. If your club has been inspired by the wonderful work undertaken by Aquabox and would like run a fund-raising event, we would be more than happy to support you in this endeavour. Please get in touch through our ambassadors network or contact us via the website. We would be happy to help.